The third beta version of iOS 8.2 Firmware i.e. iOS 8.2 Beta 3 (Build: 12D5452a) for iPhone, iPad, iPod Touch and Apple TV devices has been officially seeded and released by Apple for experimenting and testing purpose by iOS developers and non-developers (general users). The Direct Download Links of iOS 8.2 Beta 3 IPSW Firmware for iPhone 6 Plus, iPhone 6, iPhone 5S, iPhone 5C, iPhone 5, iPhone 4S, iPod Touch 5G, iPad Air 2 6G, iPad Air 5G, iPad 4G, iPad Mini, iPad Mini 2, iPad Mini 3, iPad 3G, iPad 2G and Apple TV 3G is available. The official changelog and release notes of iOS 8.2 Beta 3 Firmware (Build: 12D5452a) includes several new functionalities such as; Bug fixes, Performance enhancements, WatchKit improvements etc. 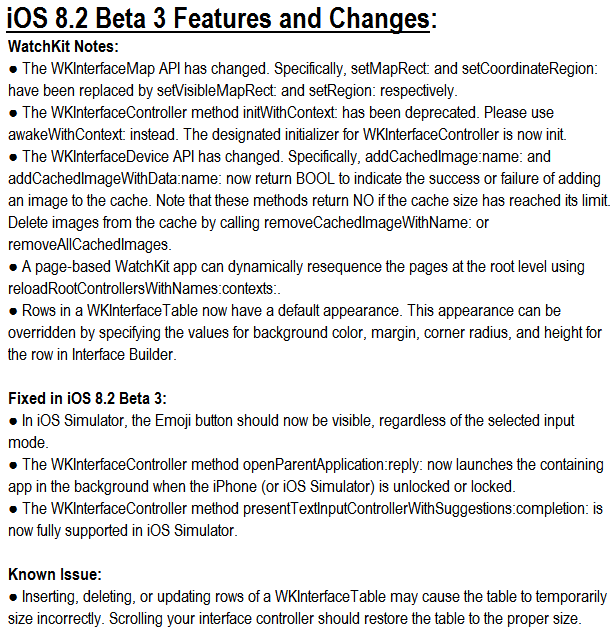 Full iOS 8.2 Beta 3 Update features can be read HERE and in below image! How to Install iOS 8.2 Beta 3 Manually? 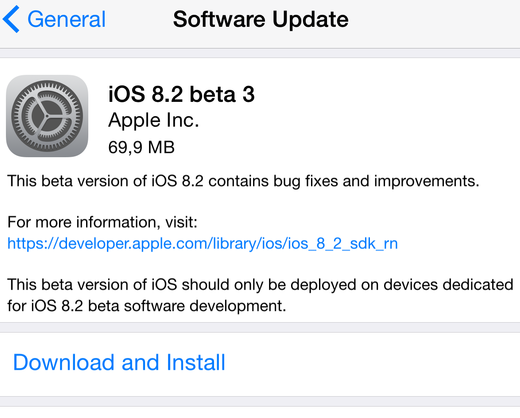 Apple iOS 8.2 Beta 3 can be update / upgrade / install through Over-the-Air automatically. Users can receive iOS 8.2 Beta 3 OTA Update wirelessly via Settings > General > Software Update option. Apple iOS developers can visit iOS Dev Center website to get iOS 8.2 Beta 3 Downloads officially. Apple iOS non-developers can install and activate iOS 8.2 Beta 3 without UDID and developer account via iTunes for Free. You can Untethered Jailbreak iOS 8.2 Beta 3 Using Taig Jailbreak Tool for iPhone, iPad and iPod Touch. Follow our Guide and Tutorial HERE.